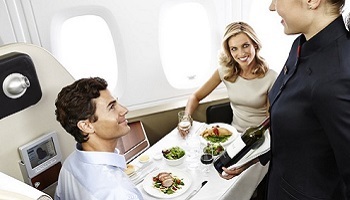 As a Qantas First customer, we aim to provide you with a journey of unsurpassed luxury. Our dedicated First Hosts* will be on hand to anticipate your travel needs. In our flagship Sydney and Melbourne lounges, our First Hosts will contact you the day before travel with information on our facilities and to arrange anything else you may require for your journey. At Sydney and Melbourne International Airports, you’ll be greeted at the curb and taken through to the dedicated First check-in area, at least one hour before your departure time. From here we’ll fast-track you through immigration+ and invite you to relax in the award-winning International First Lounge. You’ll have a dedicated boarding lane at the gate, which you can use to board the aircraft with ease at any stage of the boarding process. - A Concierge and First Host ready to assist you with your travel needs. - Our award winning Marc Newson-designed lounge, with multiple seating arrangements to suit your mood. - A signature menu created by leading Australian restaurateur, Neil Perry. - Complimentary treatments at our luxurious Aurora Day Spa. - Private business suites equipped to help you continue working. - A library, magazines, newspapers, internet access and plasma screens to keep you entertained. 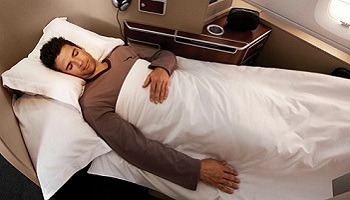 Experience a new level of inflight comfort as you stretch out in your fully flat, extra-wide bed. Our Bedding Down service features luxurious pillows, blankets, a duvet as well as a sheepskin mattress. Controls at the end of your armrest move your seat, leg rest and lumbar positioning from a relaxed reading position, to a fully flat bed of up to 212cm on our A380 and 200cm on our B747s. Your space also features an ottoman so you can host a companion inside your suite during the flight. Rockpool and Qantas have taken inflight dining to new heights in First. Enjoy our unique restaurant-style dining experience, with the opportunity to indulge in an eight-course tasting menu or choose to dine with an a la carte menu offering signature dishes. All meals are designed by Neil Perry, prepared on board and made to order with the finest ingredients. Consult one of our Sommeliers in the Sky, who’ll advise you on our selection of award-winning wine and champagne to match your meal. Having won Best First Class Sparkling, Best Presented First Class Wine List and Best Overall Cellar at the Cellars in the Sky Awards 2012, we're sure you'll find something to suit your palate. Snacks or light meals are available at any time during your flight. Choose from prestige wines, spirits and beers, along with leaf tea and espresso coffee. Sit back and let us entertain you. Our inflight entertainment system features 17 inch touch screens on the A380 and 10.4in touch screens on our B747 aircraft, with noise-cancelling headsets and on-demand control so you can watch what you want, when you want with high-quality audio. With hundreds of options to choose from, we’re sure you’ll find something to suit your mood. Our selection includes a wide range of movies, TV programs, CD albums, moving maps, interactive games and a selection of radio channels. Personal telephones are also available in every seat, as well as the option to reply text message. You can choose to use your own laptop with 110v AC power outlets to keep you going. 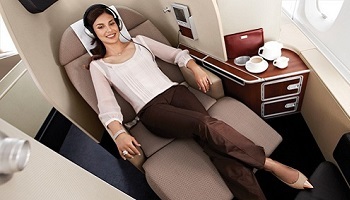 Qantas First customers will enjoy luxurious SK-II products, available now on flights to Dubai and rolling out to all first routes by July 2013. Our specially designed amenity kit for both males and females include skincare, toiletries and an eye mask. All First customers will also receive a 100% cotton jersey two piece charcoal grey coloured sleeper suit, branded First with black trims and black embroidered kangaroo. Each sleeper suit is tied with a black satin ribbon with a pair of slippers branded First and a pair of black socks.